Red and Black beans are the beans in Cuban cooking that usually accompany white rice, and any other side dishes. They are almost always served with dinner or some main meal of the day, They are a staple (though with modern times and all I've seen that due to time constraints or not that much involvement in the kitchen many just eat rice and on the other hand beans become occasional) More commonly the staple is black beans (for western Cuban cooking) and red beans is more popular in Eastern Cuba (or so I've read somewhere and or assume because of the popularity of "Congri" there as opposed to "Moros" which is more common in western Cuba) usually a meal will have. In addition we sometimes cook large heavy Spanish and Cuban style bean stews with chorizo, lots of beef or pork, orange fleshed squash, potatoes, etc. one large hardy stand alone bean stew. These heavy stews can stand alone and need only rice or bread, and if one wishes a salad. Red beans are sometimes utilized to make these heavy "Potajes" such as my "Potaje de Frijoles Colorados" but sometimes I'm in the mood for a simple red bean soup that I can eat with as a side with any meal to accompany my rice, and meat or seafood sides and veggies. 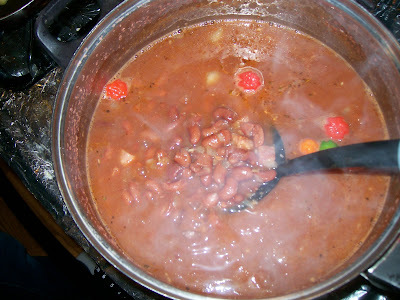 (1) Bring beans to a boil in water with pork bone or ham bone (optional). 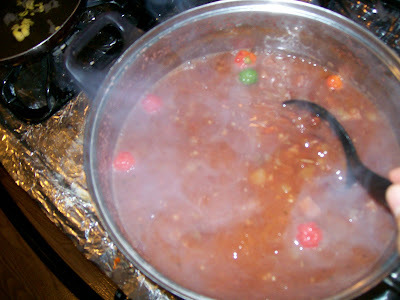 Boil until tender about 1 1/2- 2 hours depends. 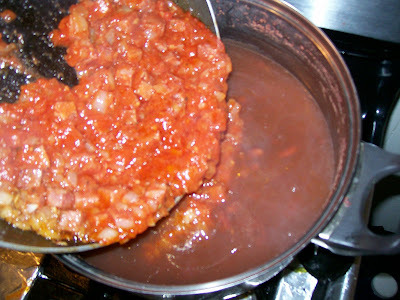 (3) Add what you sauteed in the lard and or bacon grease to the boiling beans when they are tender. Then add a handful of cachucha peppers (we call "Aji Cachucha"), add salt if needed, let beans simmer uncovered on medium heat until thickened stirring occasionally an additional 10- 20 minutes. (1) Even if the red beans are being served as a side or soup to accompany other stuff, I still like adding a little bit of chopped up pork meat because it lends good flavor as well as the bone. And it's not that much only 1/2 lbs. meat for 1 lbs. beans. 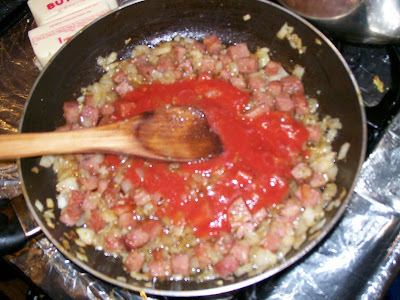 You can leave out the meat completely if you wish and just make a "bacon" sofrito to. (2) If you don't have "aji cachucha"/ cachucha peppers simply substitute by frying together with the onions 1 green bell pepper minced. 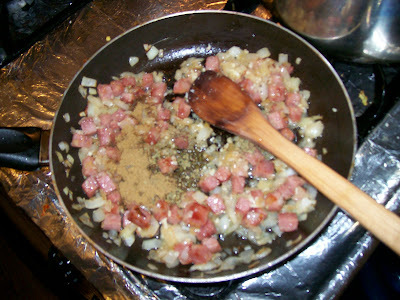 (3) Red beans depend heavily on pork, they are usually always cooked with pork products and are best that way to. But if for some reason your super kosher or paranoid (even though pork fat is less saturated than butter, high in monounsaturated fat, and most of it's saturated fat is stearic acid which converts to mono-fat in the body) then you can substitute for a good quality olive oil I guess, but it WONT BE THE SAME! I'm submitting this recipe over to Cook Sister who is hosting the famous My Legume Love Affair this month, brainchild of Susan at The Well-Seasoned Cook. Keep the good stuff rolling. 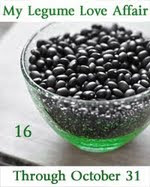 It's been a while now and I felt like getting some inspiration on different ways to cook my beans. Cold days are near and I should be ready for that. Love your Frijoles chico. Hope you didn't get angry at me with my answers to your mail questions, I was really serious but didn't want to hurt anyones feelings. Just wanted to share a funny thing. 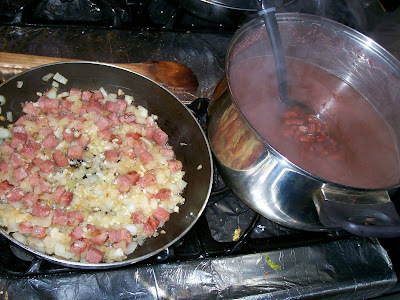 Hey Nathan: Although the rice cooked together with red beans (congri) is more typical of eastern Cuba, the potaje (pottage or stew) version is quite popular throughout all of Cuba. In some cases small sections of corn on the cob is added to the stew. Even if you use a lot of porky products in the red beans, you can always drizzle some good olive oil when serving, of course. Unlike Brazil the Yucatan, and other places, our black beans are usually vegetarian, but sometimes a ham bone is used, just for kicks! haha cuban accents, it could also be "Frijoleh Colorao" haha. Very delicious. The best red bean dish I have ever had and trust me. I've had them all, from desserts to savory dishes but this one tops it. The ham adds a silky sweetness to it and the lard and rest of the ingredients add a savoriness to it. Very well done. 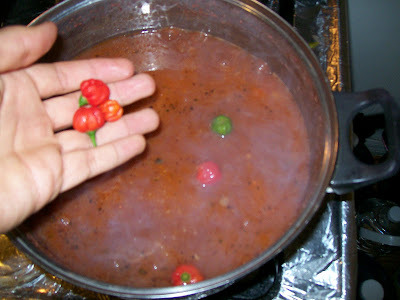 Two things I would've done was add pimienton to it as well as remove them stems off the aji Cachuchas. It slightly reminds me of my other favorite bean dish, pork and beans. Maybe you should have some little squares of bacon floating in there too? Wow - that looks good! With the weather turning cooler now, this is the sort of comfort food I'm craving... Thanks for taking part in MLLA this month! Hi, I just made this recipe today and it turned out so good. The only thing I did different was to add a bay leaf while the beans were boiling. And next time, I'll probably let the beans cook a full 2 hrs so they're more tender. I look forward to trying more recipes.